Over the years, VTA has evaluated many alternatives for a Bus Rapid Transit, or BRT, project for the El Camino Real corridor including various lengths of median-adjacent bus-only lanes. 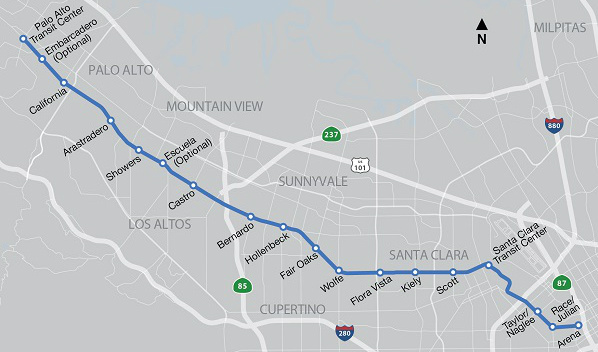 After much analysis and coordination with the cities of San Jose, Santa Clara, Sunnyvale, Mountain View, Los Altos, and Palo Alto from 2010 through 2014, it became clear that unanimous support for bus rapid transit on El Camino Real was insufficient to advance any of the designs identified through the environmental analysis process. Seeing no clear path forward for the bus rapid transit project, the El Camino Real Rapid Transit Policy Advisory Board (PAB), which had served a guiding role in the early stages of the project, reconvened and decided to pursue a new design in the hope that it would attract corridor-wide support. The PAB settled on a new design that would apply carpool rules similar to those on the freeways to the right through-lanes during weekday peak periods. That design was intended to increase travel speeds in the right lane to expedite bus travel and encourage carpooling. To test the effectiveness of the new design, the PAB opted to pursue a pilot project to evaluate the impacts before recommending that VTA pursue a corridor-wide implementation. City Councils along the corridor were asked to choose whether to participate in the pilot with a goal of receiving unanimous participation. After meeting with multiple councils—all of which opted not to participate in the pilot—it became clear that the PAB’s design was not the solution cities were hoping for either. As such, the PAB’s work plan has concluded.